The FlowCam is capable of imaging a variety of particle types. To accommodate such particle variability, the FlowCam's camera capture settings must be adjusted to your particle's unique characteristics to capture the highest resolution images. However, samples are precious and may be expensive or limited in quantity. The last thing you want to do is waste sample on multiple runs while trying to optimize your camera capture settings. For this reason, we've developed "File Processing Mode". 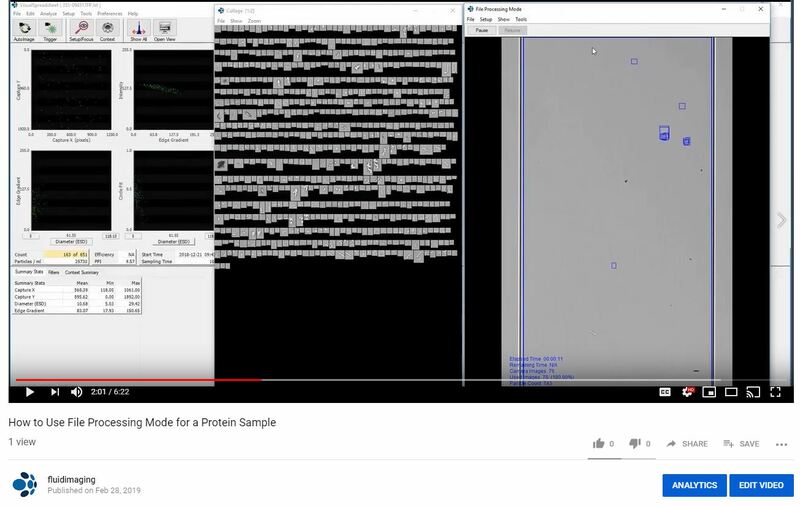 Step-by-step videos on how to use File Processing Mode for phytoplankton and protein samples are available on the Fluid Imaging Technologies VisualSpreadsheet Help playlist on YouTube. or change their sampling and analysis SOP. While an initial sample is required, reprocessing allows you to rerun your sample virtually as many times as you need to optimize your capture settings, and ensures your FlowCam is optimized for subsequent sample analysis. Additionally, acquisition filters can be added or removed in File Processing Mode to further manipulate data output. If you truly only have one precious sample, we suggest you manually prime the sample into the FlowCam's flow cell, in addition to File Processing Mode, to manually focus and have full control over sample expenditure. You can watch videos on how to reprocess a phytoplankton sample or a protein sample. This video and other VisualSpreadsheet Help videos are available on the Fluid Imaging Technologies YouTube channel.